This is an unusual Dobro assembled from parts by John Dopyera in his Grants Pass, Oregon shop in the late 1940s. This quote from JD, that accompanied a photo of a similar guitar, in Bev King’s “Dobroist Scrapbook”, published in 1991. Is a good place to start. There are some interesting things about John Dopyera’s comments. I think he has actually confused this guitar with a National Aragon. Without going into a bunch of detail, the Aragon sold for $175 back then and is quite rare. The current price for one is easily over $10,000. The Dobro model, pictured here, is similar to a model built by Regal and branded as “Norwood Chimes”. Back then it sold for $37.50. But there are some significant differences between this guitar and the “Chimes”. Both have 13 fret necks, which is very unusual. And they look very similar. The biggest difference is that this guitar passed through the hands of John Dopyera himself. There is an inscription inside that says “Assembled J Dopyera June 12-47 Grants Pass Ore”. This could be one of the three he mentioned having been given to him. 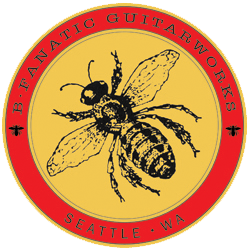 He later finished building it in his shop in Grants Pass in the late ’40 and by then, Dobro long gone. The neck on the guitar in not the same spec as the production model. It has unique fretboard inlays and looks to be hand stained rather than the typical dark sprayed, burst of a production Regal build. 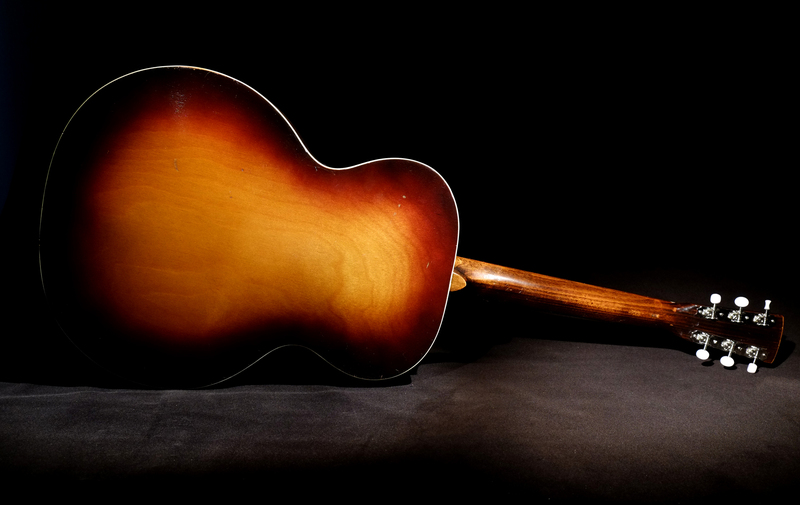 It looks to me as though the production models had a dovetail neck joint and this Dobro was constructed with a neck-stick, the preferred method for connecting necks in reso guitars. It also has one of those not-to-common “Stars and Moon” coverplates. The guitar is in almost original condition. Someone put Schaller tuners on it, (probably a by-product of the 1970’s), but the original three-on-a-plate Klusons left their mark. So replacements were a perfect fit. Although the cone had been replaced, the seller still had the original, pristine, stamped-lugged cone (my favorite). That cone is back in the guitar, as it belongs. The guitar needed a bit of a set up work since the prior owner had installed a high nut on it to play lap style. And the neck could stand to be set back just a bid more. But I’m just not ready to remove the dot markers covering the screws through the fretboard, that John Dopyera may have put in himself. So it will stay as it is for awhile. 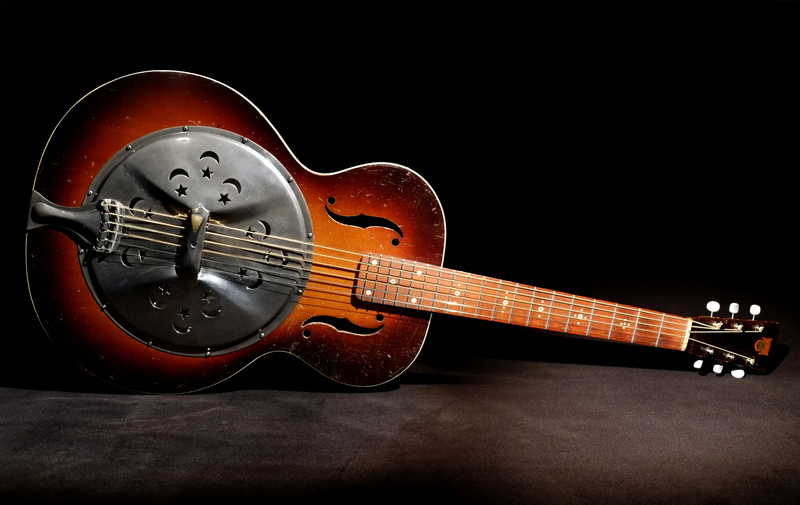 This is a most unusual guitar, with an interesting place in Dobro history, signed by the father of the resonator guitar. The inscription was worth the price of admission. And everything about the guitar that is not stock on the Regal built Dobro, can be attributed to J Dopyera. SO COOL!